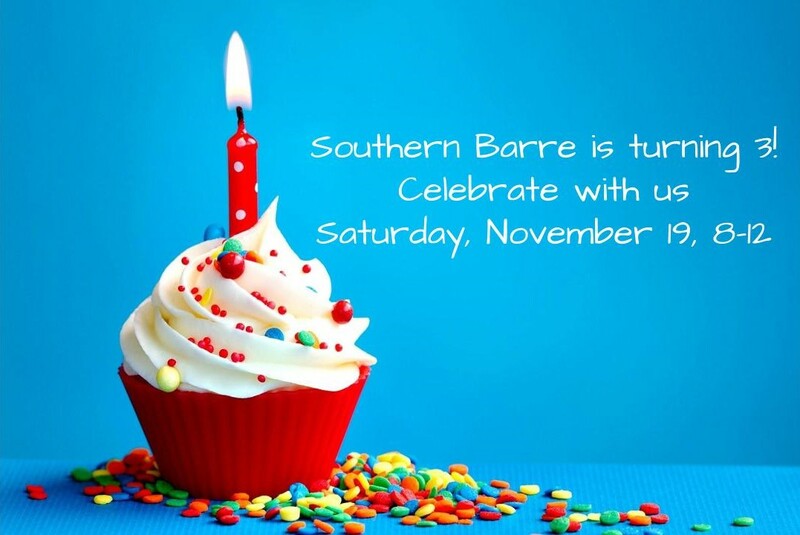 Southern Barre is Turning 3! We’re almost 3, let’s PARTY! Join us Saturday, November 19th from 8-12 to celebrate with refreshments, prizes,discounts, & classes! We will have a class package special that will be announced the morning of the open house and it will be available in studio during our open house only. We’ve also invited our friends from Loxley, Cabi Fashion, It Works!, and Beauty Counter to join us in the celebration. To kick off our celebration, we’re offering 5 days of FREE classes for new members & anyone who hasn’t been in the past year. Just select the “5-days free” pricing option at checkout. Have questions regarding if you can use this option? Don’t hesitate to reach out at info@southernbarre.com. We’re also discounting our 10 class packs! Just use coupon code “BIRTHDAY” to save $40 on the purchase of a 10-class pack, limit one per person, coupon valid 11/14/16-11/19/16.